The show I did with Pete Sakas is finally on the web site, but apparently I did not make it past the cutting room floor, however Pete and the birds were smashing. Here is the link to send to everyone: http://www.wciu.com/#74. "When we come to this wall which is seemingly impossible to get over, the only answer is legislation. .It's the obvious answer. .The movement for spay and neuter legislation is sweeping across this country. It's been compared to a tsunami," Barker said, noting that Los Angeles, Dallas and San Antonio have passed similar mandates. 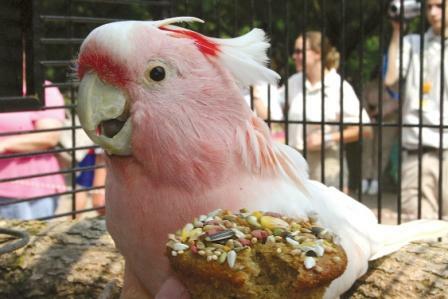 Brookfield, IL—The oldest resident at Brookfield Zoo—Cookie, a Major Mitchell’s cockatoo—is turning 75, and the Chicago Zoological Society (CZS) invites bird lovers of all ages to come celebrate his special day in high-flying style on Saturday, June 28. Possibly someone here has more information than I do, but apparently Petsmart stores in at least three states (Minnesota, Washington, and Georgia) have reported having birds in their stores test positive for psittacosis. A Petland store in Minnesota also reported psittacosis. I don't know if this is any more widespread, but given that Petsmart tends to get many of its birds from a bird mill operation in Florida, it's quite likely that more stores than these received sick birds; these are just the ones I could find reporting sick birds from a quick Google check. If anyone here has purchased a bird recently from a Petsmart, I would seriously recommend going to an avian vet and testing for psittacosis. Griffin will have his TV debut on July 4th on Animal Planet. I am also including the other show dates that will be in the Extraordinary Animals series. SInce this series was filmed by Blink Films in the UK, it has already been aired overseas. I did find this link about Dr. Pepperberg and Griffin in The Sun" newspaper web site that discusses the show.